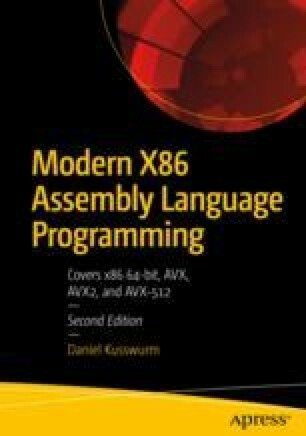 The final chapter of this book reviews several source code examples that demonstrate advanced x86 assembly language programming techniques. The first example explains how to use the cpuid instruction to detect specific x86 instruction set extensions. This is followed by two examples that illustrate how to accelerate SIMD processing functions using non-temporal memory stores and data prefetch instructions. The concluding example elucidates the use of an assembly language calculating function in a multithreaded application.